Warning: I’m not a doctor. I’m just a tech CEO who incidentally is obsessed with biohacking his way to superhuman levels of human performance. Use this information at your own discretion. Sometimes our friends tell us the truth and we just don’t listen. Sleeping problems were dancing a little jig on my life. Caffeine was the clearest and loudest culprit. I wasn’t listening. Shameless plug: Our software gives a stress-free productivity boost. And also provides a pronounced cognitive lift by clearing up “mental RAM.” Try it for just 48 hours and you’ll see. I still drink coffee2, but never past 2pm3. That helps. But what about that spontaneously-inspired nighttime writing sesh? Or that drive-by-meeting that goes into the wee hours? How does one get a mental bump without harming sleep? The benefits vary slightly depending on the preparation and they go well beyond the stimulant-free nootropic effects. Turmeric is an astoundingly versatile and powerful medicine4. It has anti-inflammatory, nootropic, anti-cancer, anti-viral, anti-bacterial, anti-depressant, BDNF boosting, liver detoxifying, glutathione boosting properties … And more. And it tastes amazingly great in both sweet (chai tea) and savory (Indian curry) recipes. Black pepper is a natural bioenhancer. It increases the bioavailability of turmeric5. Finally, coconut oil is a natural source of brain-fueling6, fat shredding7, candida-killing8 medium-chain triglycerides and has a host of other wonderful health benefits. While many of the effects of this tea are cumulative, it also provides an immediate boost in brain function. Turmeric can interact with prescription medicines. Talk to your doctor. While this recipe is “all natural,” the combination and volume of these ingredients kick it up to the therapeutic range of effectiveness. Be sensible. Also, turmeric can leave yellow stains on some surfaces and kitchenware. Test it out a bit before going turmeric-wild. Bring water to boil and lower to simmer. Add turmeric and black pepper. Simmer for two minutes. Add coconut oil. Simmer for two more minutes. Remove from heat and let it cool for a minute otherwise the oil can burn your mouth. Sweeten and serve. It tastes like a “chai latte” but without any dairy or caffeine. You may choose to strain it for a silkier drinking experience, but you may also lose a bit of the medicinal effect. I swirl mine around, unstrained, in a mason jar as I sip it over late-night writing projects. Bonus: Try a Cogni-Chai “Latte” as a coffee and cigarette replacement. Turmeric actually ameliorates some of the complications of smoking cessation. And as you already know, a Cogni-Chai Latte is a viable replacement for coffee. So, you now also have an excellent replacement ritual, and replacement rituals are a very effective method of habit change9. To give a nicotine-addicted brain a further boost, consider supplementing with a therapeutic dose of tyrosine10, p-5-p, and vitamin C first thing in the morning on an empty stomach. This can boost the supply of dopamine and norepinephrine a former smoker tends to find in short supply. Put all ingredients in blender. Add desired amount of water (and sweetener, fruit, or other smoothie-goodness that suit your nutritional and taste requirements). Blend. This recipe as is, without sweetener or fruit, not exactly tasty. I drink it for the health benefits, not the taste. But the cognitive kick is even more pronounced than a Cogni-Chai Latte (possibly because the fiber in the greens may further boost bioavailability). Add 1 serving of Cogni-Chai base per serving of almost any unseasoned meat and vegetable dish toward the beginning of your cooking cycle. You can even pre-heat the serving to ensure a smooth consistency. Cook as desired. Serve with a side of nice Himalayan sea salt so your diners can salt to taste. This is a stealthy way to sneak even more healthy goodness into your diet. Use it zhuzh up any dish on the fly. It turns any meal into a general health tonic, a weight loss aid (just include any source of quercitin11 like red onions), and even an aphrodisiac (anecdotally). Cogni-Chai definitely gives a noticeable mental lift, and without the biological compromises often associated with cognitive boosters. But the effect of any biohack is enhanced if you’re taking foundational care of your energy levels, and diminished if you’re not. Start now. Turmeric is light and heat sensitive. Store it in a cool dark place (like your refrigerator), and only add it to food before serving. If you cook a dish with it and chuck it in the fridge for later use the medicinal effects will be significantly lowered. Have you tried Maximum Vibrance? Blows Green Vibrance out of the park! 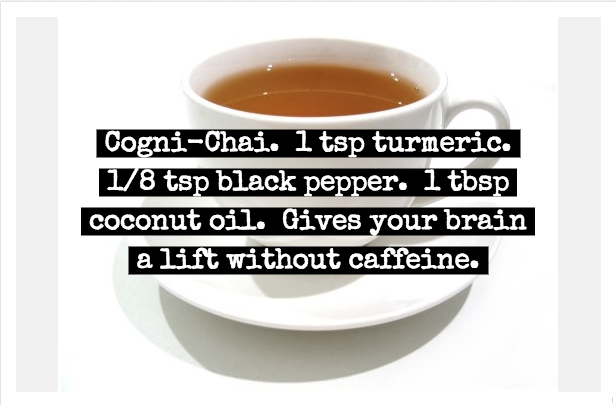 I will definitely make this cogni chai with it, but courtesy of your brain pill segments, I have just developed my own recipe and will be testing it out in a few weeks! I am excited! @TeddyStanowski Didn’t know about Maximum Vibrance – will definitely check it out. Looks like Green Vibrance + Rainbow Vibrance + a Vegan Protein + more nutrients. Awesome. You say not to make food with turmeric then store it but can you make the base in advance and store it? I appreciated the plug about turmeric helping with smoking cessation. Any other recommendations about smoking cessation? Or can you point me somewhere that can help?4 days in, and I’m committed but it hasn’t been nice.